The HED International Lab-Cast Model TC-71LC Tape Caster has been designed specifically to meet the needs of the small developer and is ideal for lab scale studies. Lab-Cast is simple to use yet sophisticated enough to provide a versatile research and development platform. This system allows developers to have a natural transition to HED International’s PRO-CAST Series of Tape Casting Machines, when a full-scale production system is required. Individual welded sections of aluminum compose the drying chamber and are joined together to form a continuous enclosure with an aluminum plate forming the chamber floor. The chamber is equipped with tempered glass view ports that are removable for product access. Casting is with a doctor blade on a granite surface plate. The precision surface plate is securely mounted in a height adjustable support fixture at the entrance end of the tape caster. 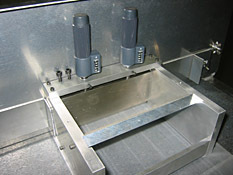 A manually adjustable exhaust fan is located near the entrance end of the tape caster for efficient counter-flow removal of casting vapors. 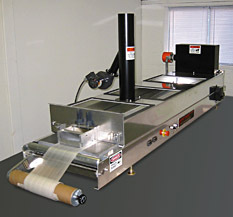 A 3 KW heater is located at the exit end of the tape caster, in the inlet duct, to enable counter-flow heated circulation through the drying chamber. 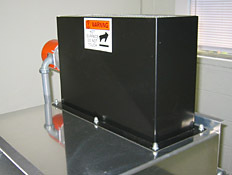 Electric resistance heaters are attached to the underside of the drying chamber and arranged into one temperature control zone. Each zone of heat is equipped with independent temperature sensing and control. A variable speed drive, designed for use with paper or Mylar, a carrier payout, spool shaft with manual tension adjustment, and an easily removable carrier take-up spool are provided. All control instrumentation, switches, function labels, status lights, relays and fuses are located in the caster structure. The electrical service is 115V/230V/60Hz.